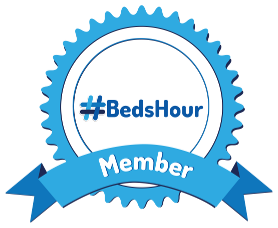 The #BedsHour logo, the #BedsHour font and the #BedsHour rosette are all available here to download for free, to use however you want. You might want to read a little about how the #BedsHour branding came about. Thank you all for voting for your favourite rosette design over the last few weeks. After a very closely run contest we now have a clear winner!! It is my pleasure to share with you the files you will need to add the Bedshour rosette to your website – or where ever you want. Created by JuliaVDesign it is gifted to the Bedshour community and is completely free to use by all members. To download the files try right-clicking or long-pressing on the download links above and choosing “Save Link As…” or similar. Usage help and legal information is below. WLD contacted Clare at Stanmore IP to seek guidance on the best way to achieve gifting the work to the community. Clare was very helpful in explaining some options and suggesting some things that hadn’t been considered which ultimately guided us to the free and permissive licenses we chose for the works. Intellectual property management is very important for business and WLD are delighted that Clare from Stanmore IP has confirmed this logo to be free to use. If your business needs any support with intellectual property related matters please do contact her @stanmoreip and of course you will find her on #BedsHour. To make it especially easy for you to adapt for your own purposes branding has been developed in 2 components – the hashtag graphic and a font you can install on your computer (the font itself is called BedsHour). The graphic is a SVG/Scalable Vector Graphic format which is an open standard file format that can be used in most programs on Mac, Windows, Linux and more. The font is a TTF/True Type Font format which is a very widely supported format that can be used in most programs on Mac, Windows, Linux and more. WLD is expecting to provide OpenType and WOFF font formats in the future so the BedsHour font can also be used in web pages. When the font file is installed you can write any text in any size and it will look identical to the BedsHour branding. You can make it say whatever you want. When you open the vector image you can import it in to your project with the default text. If you have a vector-based image editing program and have installed the BedsHour font before opening the SVG, you can edit the default text right inside your image editing program. Please do share examples and inspiration of your usage to encourage and assist others. We’ll all be very excited to see what ideas and uses the community comes up with and hopes that by contributing this work, it will act as a catalyst for future projects which benefit the whole BedsHour community.